This World War II-Era Sterling Silver and Enamel Case with Fighter Plane is no longer available. 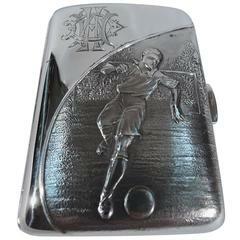 George VI sterling silver and enamel cigarette case. Made by John Henry Wynn in Birmingham in 1945. Large rectangle with hinged and enameled cover depicting an English fighter plane (the Mosquito) flying high in the sky. All-over engine-turned ornament. Interior gilt washed. A great World War II-era aviation collectible. Hallmarked. Gross weight: 7 troy ounces.